If you are considering living in Thailand, it is probably a good idea to begin thinking about what you will do about transportation. Mass transit, outside of Bangkok, is basically non-existent. Most towns have converted pickup trucks that act as taxis and pick up people for short rides for a few baht (thus the name “baht buses”), or you might wind up riding in a motorcycle side car which do the same, and there is a pretty extensive bus system between towns. Lately Uber is a convenient and inexpensive way to get around. But for everyday trips to the market, a local restaurant, the shopping malls, or just a drive in the country for a picnic, you will probably want to have your own set of wheels. The number of wheels you get becomes the real question. We decided on buying a used car. Most towns will have an area where used cars are for sale (at places called “tents”) and some will have a Sunday market where you can go and do some car and motorcycle shopping. Used cars are quite a bit more expensive than they are in the west. This is probably because maintenance and service in Thailand is very good and inexpensive and used cars can last many decades. And they often do. I have a friend driving a car that is at least 30 years old. The used car we bought was a 5 year old Toyota. The cost was Bt275,000. That was 5 years ago and it has only been in the shop a few times for basic maintenance. We are looking forward to many more years of faithful service. Buying a new car or pickup was never a question. But then it came time to decide on a second vehicle, for all the normal reasons. But a second car was a bit out of our price range. So we decided on a motorcycle (for me of course). Now I use that word “motorcycle” quite loosely. I mean, those guys on the U.S. TV series Sons of Anarchy*, who ride around on those huge, stripped-down Harley hogs wouldn’t use the word “motorcycle” for what I ride, but I am happy with my 125 cc Honda Dream. I’d love a big bike but with the narrow alleys and dirt roads I go down, a small one is more suitable. 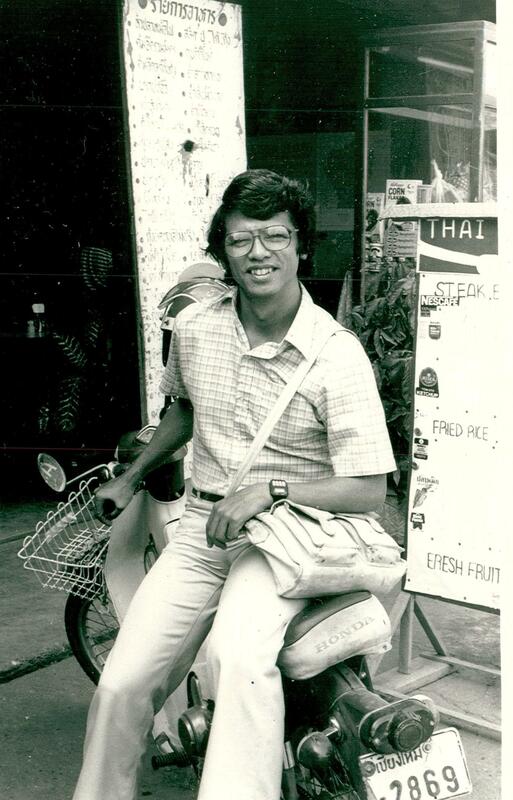 For many reasons, new Expats to Thailand will wind up riding motorcycles. I think it is important to talk about some of the things a motorcyclist will encounter on the Thai roads. You will be shocked and amazed. When I first came to Thailand as a Peace Corps volunteer, there were two basic rules that we had to follow. The first was that we were not allowed to ride motorcycles. And the second was, when we did ride motorcycles, as they knew everyone would, we had to wear a helmet. 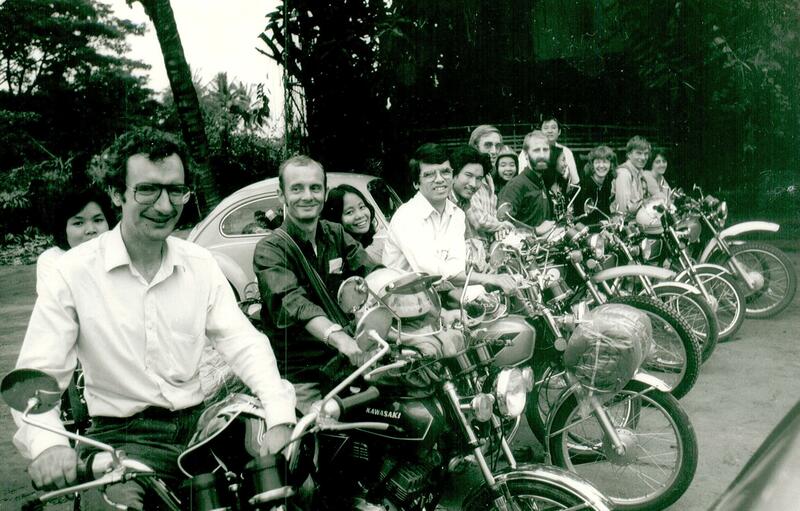 Back then, the first purchase of almost every volunteer was a motorcycle, and the second was a helmet. My first bike was a 50cc Honda. I had never been on a bike before, and after paying for it, and getting some brief driving instructions from the salesman, I got on to ride it out of the showroom. I quickly bounced down the sidewalk and turned into on-coming traffic, going down the road the wrong way. How it happened I can’t be sure, but I did survive. On my first drive into the countryside I came across a flash flood covering the highway, from one rice field to another. So of course I drove right through it (I have since learned how dangerous that was). The water came up over my engine and my spark plug got soaked and I had to wait an hour for things to dry out so that I could start the bike up again. Then I realized that I had to go back down the same road to get home again. So, I rode right through the flood again, got the spark plug wet again, and waited another hour for things to dry out again, before returning home. I am happy to say that I have since become a much better motorcyclist than when I started out. This depends on the size of your bike. The most popular are Honda 100cc bikes. New they cost about Bt30,000. My 125cc is more in the Bt35,000 range and the new automatic transmission bikes are closer to Bt50,000. Of course I buy nothing new so my 2 year old used bike cost Bt25,000. There are bigger bikes for sale here too but they can be quite expensive and they seem to have a very punishing registration fee for the bigger bikes. The Sons of Anarchy could even find a few 1300cc choppers around. Lots of tourists come here, rent a motorcycle for the first time in their lives, and wind up in serious trouble. I was at the hospital ER with someone I knew when they rolled in a western tourist with a nice white bone sticking out of his leg. I went over to help with translating for him and found out that he and some friends had rented bikes, went up into the mountains, and he let his mind wander while riding, and wound up driving off the road and breaking his leg. The doctors said it would be at least 6 months before he could walk normally again. He had never driven a motorcycle before that day. Moral of the story: Learn how to ride. Take it slow at first. Save the mountain riding for much later. Another story. Last week as I was coming down the highway I saw an accident up front. An older Expat man was lying in the middle of the road. He was semi conscious and was bleeding profusely from a long deep gash along the side of his head. He had been riding on the back of a bike when the driver swerved to avoid a car and he had fallen off. He wasn’t wearing a helmet. What should have been a bump on the head and a headache became something much worse. I couldn’t follow up on what happened to him but judging by his injuries and his age I would say that his retirement has been very rudely interrupted, possibly terminated. Moral of the story: Whether you are driving a motorcycle or are a passenger, wear a helmet. It is also the law and if caught without one is a Bt400 fine. Probably less than 50% of Thais wear helmets. But this is one aspect of the culture that you don’t have to follow. There are car drivers licenses and motorcycle licenses. They are different. If you already have a license from your home country then it is quite easy to get one here. So be sure to bring your old drivers license here and all it will take is some paperwork to get a Thai license. Otherwise you’ll have to take a written test and a driving test. These can be quite a hassle. Although Expat conventional wisdom tells you that there are no traffic rules in Thailand, there really are. It is just that not everyone follows them. Remember that Thais drive on the left (opposite from U.S. but the same as the Brits). It is important to keep in mind that if you are on a motorcycle then you are probably smaller than anyone else on the road except bicycles. That means that you let the big guys go first. Why? Because they are bigger, and no matter if you throw a rock at a glass, or a glass at a rock, it will be the rock that wins out in the end. Bigger has the right-of-way, maybe not legally, but I wouldn’t want to argue that in court after losing the rock/glass battle. Very often you will see people driving down the “wrong” side of the road, against traffic. I put the word “wrong” in quotes because they don’t seem to think there is anything wrong with it since it saves them a few minutes. Interestingly, I have seen Expats doing the same. My advice is to avoid doing something so foolish. If you are retired then you don’t need to save those few minutes. You’ve got lots of time, that is unless your drive down the wrong side of the road without wearing a helmet. Then you might find that you have less time than you would like. There is a saying in most drivers’ ed classes that when you come to an intersection, stop and look both ways. In Thailand I would change that to look six ways; left and right, front and back, and for good measure, up and down. When you come to an intersection be prepared. People will try to pass you in all of those directions. Because pedestrians are smaller than you, you have the right of way (see above). No one here stops for pedestrians, neither 9 month pregnant ones, nor little old ladies, nor little children, and never for a Farang. It wouldn’t even cross a typical pedestrian’s mind that a car or motorcycle would stop to let them cross. So, if you are from Seattle like I am, and have become used to letting everyone cross before you can go on, and want to do that here, then check very carefully behind you before you stop to let a pedestrian cross or you might find that your back end might need some serious body work after the car behind slams into you because, why in the world would anyone stop to let a person cross the street? Also, since the pedestrians will not know why you are stopping, you might have to wave like crazy to tell them it is okay to cross. It is really a no win situation. Just let them wait. They are used to it. Here is the most important piece of advice I have to give to motorcyclists. Drive way to the left and drive very slowly. I do not go over 50-55 kph and that is only on the open highway. Since one of the definitions of being retired is I never have to hurry anywhere anymore, taking it slowly has not turned out to be a problem. Most motorcycle accidents I have seen involving Expats have had something to do with alcohol. Either the Expat was drinking or his accident was caused by someone who was drinking. So, don’t drink and drive. And try to avoid the times when drinkers are out on the road. Times like weekend evenings, end of the month after payday, holiday evenings, and really late at night. If you have to go out then get someone to drive you in their car or call up one of the metered taxis that are beginning to show up around the country. I have driven a motorcycle in Thailand for many years and have never had an accident (my computer desk is made of wood which I am knocking on right now). So you can ride safely here too. Riding can be great fun and will get you where you need to go. And it is cheap. I spend about Bt100 every two weeks for gas. That compares to about Bt2000 for my car for the same amount of time. The rainy season is not problem. Just always bring rain gear and have a good face mask for your helmet. In the hot season most Thais wear long sleeves or even a jacket. Keeps their skin white and might save you from skin cancer. In the cold season I wear a jacket, scarf, and warm gloves. It is hard to believe but you will need them. And when you finally know what you are doing, then you can go riding up into the mountains.